Because even decoys have super rares! I'm not talking about some weird and obscure japanese exclusives but western ones, that weren't available in stores. 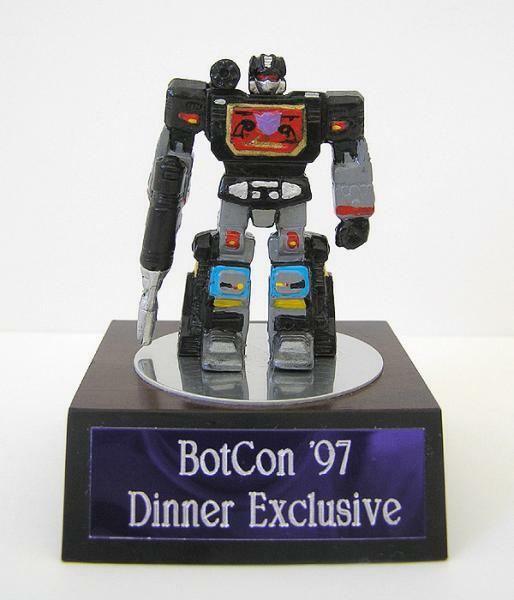 On July 18-20 1997 in Rochester, New York, was held one of the most famous convention of the TF world: BotCon. As usual several exclusives were produced, a Beast Wars redeco two-pack of Fractyl/Packrat in their Energon armours, a T-shirt and a CD too! But there was another, a dinner exclusive given to the first 100 attendees at the pre-convention dinner on friday night. It was a small white box with a little treasure inside! A decoy hand painted by the artist Dave Van Domelen, a stand with a plaque (red or purple) with 'BotCon 97 Dinner Exclusive' words engraved and a laminated panel showing a storyboard from 'The Transformers: The Movie'. Each one came in various deco: solid gold, G1 toy colors, G1 TV show colors and even battle damaged colors! 4 years ago I managed to obtain 2 of these exclusives decoys and I must say that they are very beautiful and carefully painted.